The Republic of Kosovo is a country with a high level of unemployment, which prompts the local population to go abroad to work. Kosovans stay as migrant workers in different parts of Europe, mainly in Germany and Switzerland. Accordingly, they regularly communicate with their beloved ones who stay at home. This stimulates the influx of large volumes of international voice traffic into the country. With a high level of the mobile communications sector development and a relatively high rate ($0.15 per a minute of conversation), this opens up excellent opportunities for making money on calls landing. Telecommunications infrastructure is rather weak in Kosovo due to which fact the fixed-line penetration remains low. In contrast, the majority of telephone connections and the main income from telecommunications is attributable to the cellular communication sector. 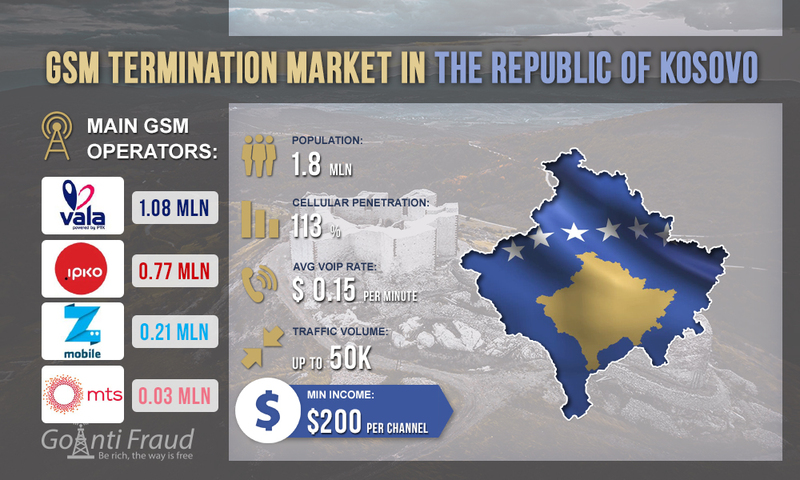 With a population of about 1.8 million people, mobile penetration in Kosovo has reached 113%, which is about 2.05 million connections. There are four mobile operators in the market with two of them prevailing (Vala and Ipko). These two mobile service providers have the best coverage spanning most of the regions. Two other local operators are ZMobile and MTS. ZMobile is the largest MVNO (virtual operator) using Vala network. On an average, a minute of outgoing call costs $0.1 in Kosovo, but there are also more beneficial offers from mobile operators. The cost of a prepaid SIM card is approximately $3.4. With voipcheap rates kosovo being rather high, the terminators have an opportunity to earn $200 and more from each GSM channel.